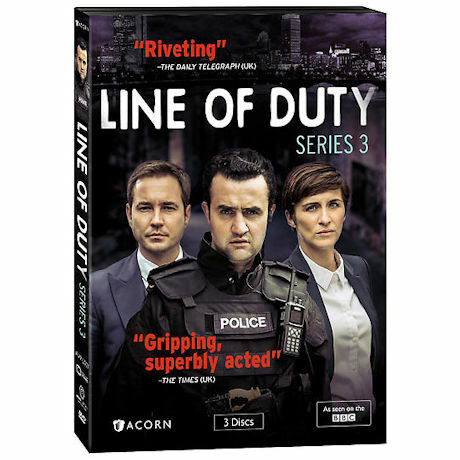 The powerful, critically acclaimed drama returns with Detective Sergeant Steve Arnott (Martin Compston, The Great Train Robbery) and Detective Constable Kate Fleming (Vicky McClure, Broadchurch) back on the trail of corrupt police officers. After a criminal is shot dead during a police raid, the AC-12 team begins examining the conduct of Sergeant Danny Waldron (Daniel Mays, The Great Fire), leader of an elite unit. But Waldron's loyal team obstructs the investigation, and the truth about the shooting proves more complicated than Arnott and Fleming could ever have imagined. Hailed as "explosive" (Mirror, UK) and "thrilling entertainment" (The Times, UK), Series 3 delivers "unbeatable, utterly unpredictable viewing" (The Telegraph, UK). Adrian Dunbar (Ashes to Ashes) and Polly Walker (Rome, Prisoners' Wives) also star, with Keeley Hawes (MI-5, Ashes to Ashes) reprising her role as enigmatic DI Lindsay Denton. 6 episodes, 6½ hours, 3 DVDs, SDH.